Dyson fans carry a price take that some find hard to justify, but experts concede that they are effective, and most owners simply adore them. If you or your budget would prefer something less expensive, we found a bevy of good performing tower, floor, desk and window fans to help you keep your cool this summer. 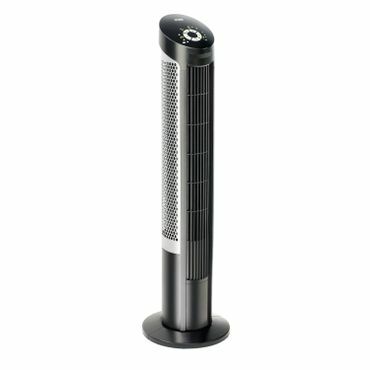 Despite its high price, the Dyson Cool AM07 is more popular with users than any other tower fan on the market. Owners love its quiet operation and its sleek, bladeless design, which makes it much easier to clean than most tower fans. They also appreciate its wealth of features, including oscillation, ten distinct speed settings, a sleep timer, and a remote control with a magnetic back that secures to the fan's base. In professional tests, the Seville Classics UltraSlimLine 40" Oscillating Tower Fan is a top performer. It delivers strong airflow at both seated and standing height, while keeping the noise down to around 68 decibels. It's also very stable and offers a wealth of features, such as an oscillating mode, 7.5-hour sleep timer, and a remote control that works accurately from up to 13 feet away. The fan is backed by a one-year warranty. With an airflow of 781 cfm, the Vornado 630 Medium Air Circulator packs enough power to distribute cool air throughout a good-sized room. It's solidly built and very easy to use, with three speeds and a pivoting head that can direct the flow of air wherever you choose. It's also fairly quiet, energy efficient, and much easier to clean than most floor fans. 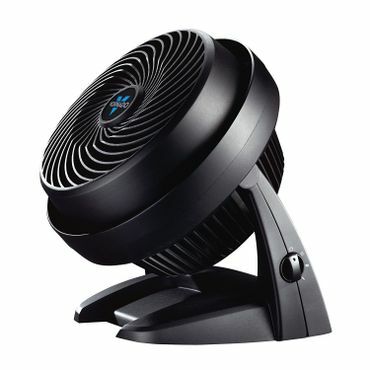 Vornado backs the fan with an impressive five-year warranty. 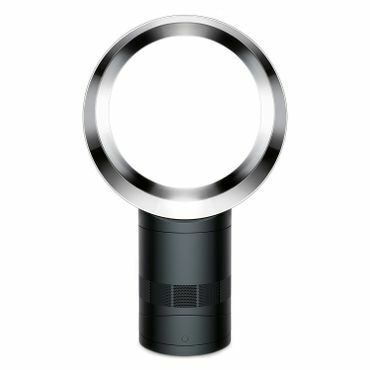 Professionals and users alike say the Dyson AM06 10 Inch Desk Fan is worth its high cost. Though it's small, its 569-cfm airflow is powerful enough to cool a good-sized room without making a lot of noise. It also has a wealth of handy features, including 90-degree oscillation, a 9-hour sleep timer, ten speed settings, and a magnetic remote control. Its bladeless design is stylish, kid- and pet-safe, and very easy to clean. The Holmes HAOF87BLZ-NUC Lil' Blizzard is a lot of fan for a small price. In professional tests, this little fan moves 274 cfm of air, and the breeze feels smooth and steady. It also has an oscillation feature, a tilt-adjusting head, and a small footprint. The front grille is sturdy enough to keep out a poking finger and can be removed for cleaning. 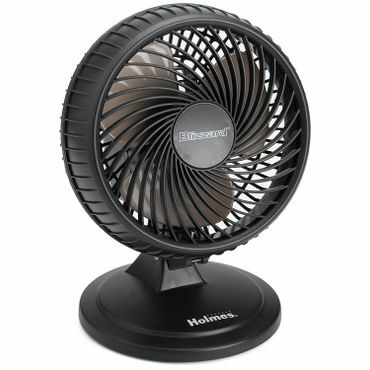 Holmes backs the fan with a one-year warranty. The Bionaire BW2300-N is an electrically reversible fan with twin blades you can control independently to draw in, exhaust, or exchange the air in your room. In professional tests, it produces a breeze strong enough to be felt 30 feet from the window, besting all competitors in that trial. It's well featured, too, with a remote control and a digital thermostat. Despite some durability concerns, it’s well liked in both professional tests and user reviews. Electric fans can be an eco-friendly way to cool your home when it's hot outside. Except for window fans (see below), they can't actually lower the temperature in a room; instead, they make you feel cooler through increased airflow, allowing you to dial down the air conditioning or shut it off altogether. That can help cut your cooling bill, reduce your household's emissions of greenhouse gases, and ease demand on the summertime power grid. As energy expert Michael Bluejay explains, a fan cools you by pushing away the "pocket of hot air that surrounds you," allowing cooler air to come into contact with your skin. They can also help your sweat evaporate faster. Thus, for a fan to work at top efficiency, it must be placed where you'll feel its breeze directly. Tower fans are a popular choice because their thin, vertical design allows them to stir up plenty of air without taking up a lot of floor space. A tower fan is less likely to tip over than a top-heavy pedestal unit, and its fine mesh grate makes it safer for use around children. Also, most tower fans come with extras such as oscillation, sleep timers, and remote controls. However, tower fans are also one of the priciest types, typically starting at around $60 and running up into the hundreds, and they're difficult to take apart for cleaning. 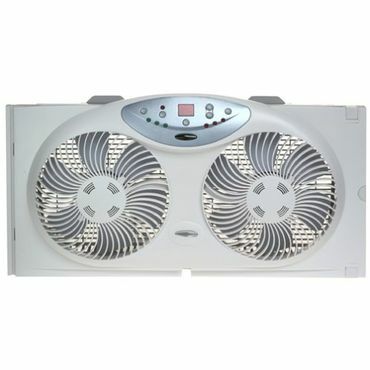 Of all the types of portable fans available, large floor fans carry the most volume – in terms of both airflow and noise. Their loudness can drown out conversation or the TV, reviewers say, and their large footprint makes them a bit harder to fit into a room than a tower fan. They're also a bit more hazardous if you have small children, since their placement on the floor makes them easy to reach and their grilles often have larger gaps than other fans-- making it easy for small fingers to reach inside. On the plus side, they're generally a cheaper option than tower fans for cooling a large space, with prices as low as $25. These are fans that can be easily placed on a tabletop or desk. While they can't produce as much of a breeze as a big floor or tower fan, they're powerful enough to cool a small space. Their small size makes them ideal for use in tight quarters, such as offices, cubicles or dorm rooms. They can also direct a cooling breeze on a single person who happens to prefer to feel cooler than others in the same room. 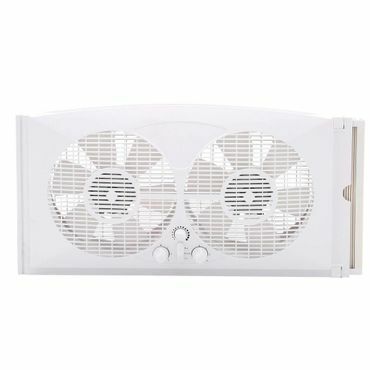 Prices for small fans vary widely, from less than $15 for tiny "personal" fans to over $100 for some high-style models. Window fans work differently from other fans. In addition to direct cooling, this type of fan can actually change the temperature of a room by drawing cool air in or blowing warm air out. Most models can work either way, and a few can perform both functions at once. However, a window fan is most effective when it's cooler outdoors than indoors – either at night or when you've heated up the house by cooking. Another drawback is that rain and bugs can get inside if the fan is left in an uncovered window when not in use. We found prices for window fans ranging from $30 to $150, with most around the $50 mark. When choosing a fan, noise can be an important factor. In general, there's a trade-off between airflow and noise level: A large fan that moves a lot of air produces more noise than a smaller and less powerful fan. However, there are significant differences in volume between various models. It's important to read owner comments about each unit you consider because fan manufacturers don't usually disclose how many decibels a fan produces. Fans vary in price from under $15 to hundreds of dollars, but cost isn't the best indicator of performance. Some expensive fans, like the Dyson Cool AM06, get excellent reviews, but we also found fans under $20 that are consistently described as powerful, quiet, and sturdy. To some extent, price differences depend on the type of fan you're buying: tower fans tend to cost more than basic box fans, for instance, and smaller fans cost less than large ones. However, within a particular category, the priciest fans tend to offer sleeker styling and extra features, such as remote controls, sleep timers, and air ionizers, which are supposed to remove dust from the air by creating electrically charged ions that attract the particles. 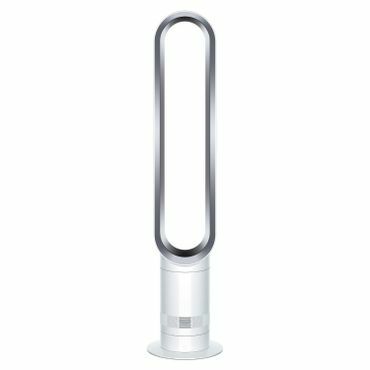 One particular feature that comes with a high price tag is a bladeless design, found chiefly on Dyson fans. Bladeless fans are safe for kids and pets, and they're much easier to clean than conventional fans, but they generally cost $100 or more. We found detailed comparison tests of fans at Wirecutter, a website that reviews gadgets of all types, and Your Best Digs, which focuses on products for the home. Both these sites identify fans with strong feedback from users and then test them, looking at factors such as airflow, noise level and more. To back up these test results, we combed through thousands of user reviews on retail sites such as Amazon, Walmart, and Home Depot. These provided information about the fans' long-term durability, as well as additional views on how they look, feel, and sound.